Have no info for this specific disc. It is a US acetate. The label text would seem to date it as 31 October 1971. 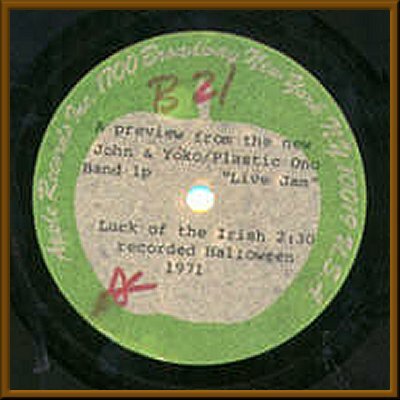 However, the notation "A preview from the new...lp "Live Jam" would date it Spring 1972. As released on Sometime In New York City, the timing of the song is 2:54. This disc notes the time as 2:30. So, perhaps, the 1971 date is accurate. Eight Arms To Hold You also lists two home recordings from autumn 1971 and a film titled Luck Of The Irish made by John Reily 12 November 1971. This disc might be sourced from one of those dates but it could, just as well, be from somthing entirely different.